For a lot of people arriving in Wiesbaden, this is the first thing they'll see when they arrive by train. 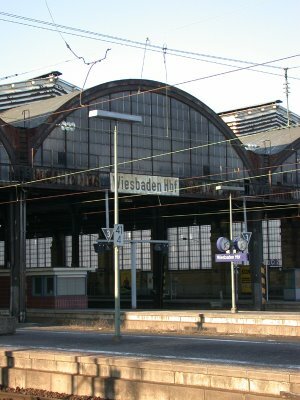 The Haupbahnhof is a termin station (Kopfbahnhof) meaning the train come in from this side and also leave here again (sort of backwards). Since I walked all the way out of the station there are no people to see (they usually don't have to walk that far and can stay under the roof). For another view from inside the station, check out this earlier photo from March. Welcome back from your vacation month. Great to see a regular flow of images coming from you again. I'm looking forward to more. So did you have a nice vacation? Nice train station photo - it looks like something out of a movie! It's nice to see it again! I love trains and train stations. Thanks. HI, I happened upon this blog looking for old pics of Wiesbaden and Lindsey Air Station back in the early 1980's. I was a young airman and my daughter was 18 months when we touched down in Germany. I loved living and serving in Wiesbaen; I was stationed at the hospitasl for almost 5 years. I learned the people,the culture and even came back and lived for a year when I got out. Thank You Nicolla for the beautiful memories.